Within our group in eastern Ontario, Canada, it was Sensei Stan Chisholm who first merged stand up sparring, ground work and weapons after his extensive research into Karate, Kickboxing, Jiu Jitsu, Brazilian Jiu Jitsu and Kali. I devoted separate segments of a class to Karate, Jiu Jitsu and to the traditional weapons. In Kung Fu, we mixed them up. It was perfectly natural after sparring with hands and legs for several minutes to pick up a knife, in fact the techniques remained the same with the only difference being a knife in one or both hands. A system is a system. Armed or unarmed, it should be the same. One of the reasons why a pair of sai, for example, may feel so strange in a Karate practitioner’s hand when performing a Kata such as one of the Nihanchi is the habit of forcing the weapon into a strictly enforced pattern with each particular movement of the Kata. The result is an overbearing disconnect. As long as you practise the concept of the The Liquid Staff. Adapt. The staff should feel as flexible as your array of kicks; the knife you pick up as agile as your blocks and strikes. And you should be able to still maintain your ability to lock or throw an opponent with a weapon in your hand. I’m currently working with a group of excellent students on the monkey staff. Once they’ve learned it, they’re going to be slowly blending the stick in with their sparring, sticky hands and locks/throws practise. Interchangeability. Flexibility, of both mind and body. The ability to adapt to the necessities of combat. 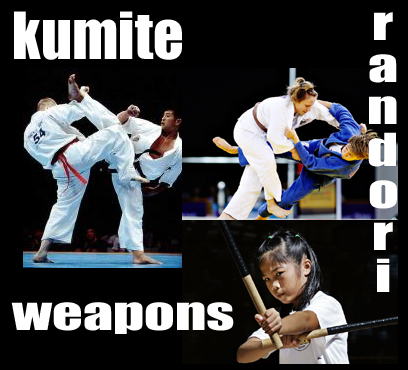 Let’s conceive of a Karate class where, when it becomes time to practise Kumite, we begin with a bit of light sparring after which we smoothly transition into back and forth throws or takedowns against bear hugs from all sides. Give that a minute or two and we’re back to sparring (low kicks only – groin, knees, ankles). Next we switch to randori against all types of choke attacks finishing with locks and takedowns. Back to sparring. Then back to free style randori from a close in Judo position. Then we find ourselves sparring again. Then a return to free style randori from stand up to ground. Then up we go for a type of sparring where we concentrate on various organs as targets. Transition back and forth throws or takedowns against bear hugs from all sides. After a few minutes, move on to sparring using low kicks only. Next we switch to randori against knife and stick attacks, finishing with locks and takedowns. Back to sparring. Then each student picks up a bo staff and spars – slowly and carefully – with these weapons. Then one student drops to the floor and spars, using kicks against her partner’s legs. Then the other drops to the floor and does the same. Next…sparring against two opponents. Then each trio picks up the knives. Careful, please! And so on. Training such as this fosters no disrespect against an original system. Bo, sai, knives are all part of the traditional martial arts world, especially in old school Karate. Look backward and open up the Karate. Let it breathe. It’s a deep treasure handed down to us! "Hello there! I just wish to give you a big thumbs up for your excellent information you’ve got right here on this post. I will be coming back to your web site for more soon."